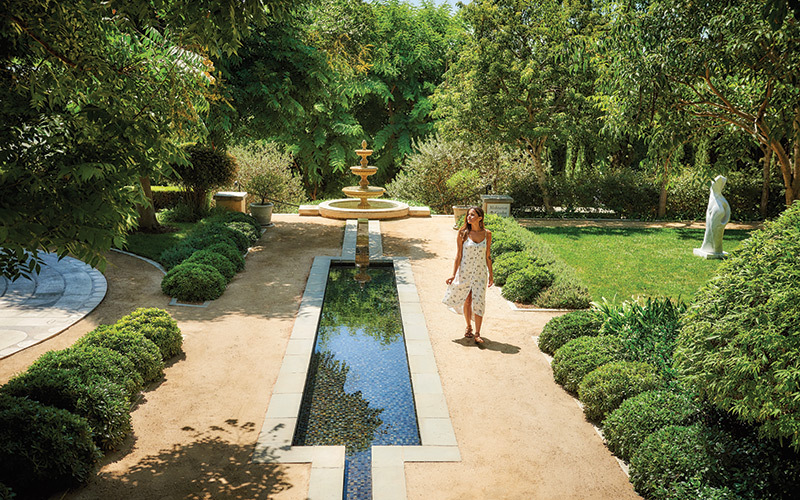 Housing more than 3,000 plant species, the jungle-like 7.5-acre arboretum is a retreat on UCLA’s campus. Take a self-guided tour (detailed on the garden’s Web site) to learn about bromeliads, cycads, and the “peculiar bunya-bunya” tree, which sheds its massive, cranium-size cones once a year. Not in the mood for a botany lesson? Park it on one of the benches along a stream and befriend the garden’s resident turtles. 777 Tiverton Ave. In 1971, Iranian immigrant Amir Dialameh came across a fire-ravaged hillside in Griffith Park, decided it would look better as a garden, and dedicated his life to making that dream a reality. Dialameh hauled plants and trees up the mountainside and carved out a series of stairways and paths that you can still lose yourself in today. (Fair warning: You’ll have to brave a short but steep hike to get there.) Find the trailhead near the Mineral Wells Picnic Area. 4730 Crystal Springs Dr.
interconnected pools, which help drown out the sound of police training at the nearby shooting range. 1855 Academy Rd. water can sustain even the most delicate of environments. The Donald C. Tillman Water Reclamation Plant irrigates this traditional Japanese-style greenspace, designed by landscape architect Koichi Kawana. If something feels familiar as you stroll among the weeping willows and waterfalls, it might be the futuristic administration building—it played the Starfleet Academy in several Star Trek films. 6100 Woodley Ave. Founded in the ’70s, the Movement of Spiritual Inner Awareness once boasted devotees like Arianna Huffington and Beach Boy Carl Wilson. Though the celebrity disciples diminished amid cries of cult activity, the mansion-style headquarters still draws crowds seeking its travertine labyrinth. Wind your way through it before exploring a lush meditation garden with 16 gurgling water installations. 3500 W. Adams Blvd.